BLANTYRE-(MaraviPost)-The UTM Party presidential candidate Saulos Chilima on Sunday warned Malawi Revenue Authority (MRA) and Malawi Communications Regulatory Authority (Macra) against abuse of public resources to fund the governing Democratic Progressive Party (DPP) election campaign. 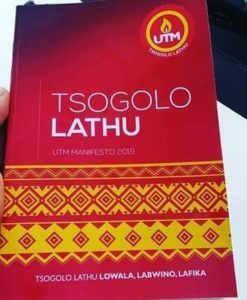 The UTM Party leader warned that the controlling officers at the two State institutions should brace themselves to account for the funds in the event of a shift of power after the May 21 2019 Tripartite Elections. “Let me warn the bosses at MRA and Macra who are funding the campaign of the ruling party using what they are calling ‘special operations’ fund. We know everyone who is involved and once there is a change of government, make no mistake, those bosses will be held personally liable”, said Chilima. He therefore also claimed to be aware of other parastatals involved in the same practice and pledged to reveal their names during his forthcoming rally in Kasungu. “In doing this, we are not only ensuring that each household has electricity and running water but at the same time we will be dealing with corruption that happens when people want to get connected,” said Kaliati. Earlier on Sunday, Chilima joined the Catholic faithful at Njamba Freedom Park in Blantyre in commemorating Palm Sunday which marks the beginning of a Holy Week to celebrate Jesus Christ’s triumphant entry into Jerusalem before his death and resurrection.